Bangkok - Thai police issued arrest warrants Monday for two more suspects, a Thai woman and a foreign man of unknown nationality, as part of a widening investigation that yielded its first arrest over the weekend in connection with a deadly bombing in Bangkok two weeks ago. National police spokesman Prawuth Thavornsiri said he was certain the two were part of a group responsible for the Aug. 17 blast at the Erawan Shrine in central Bangkok that killed 20 people, more than half of them foreigners. 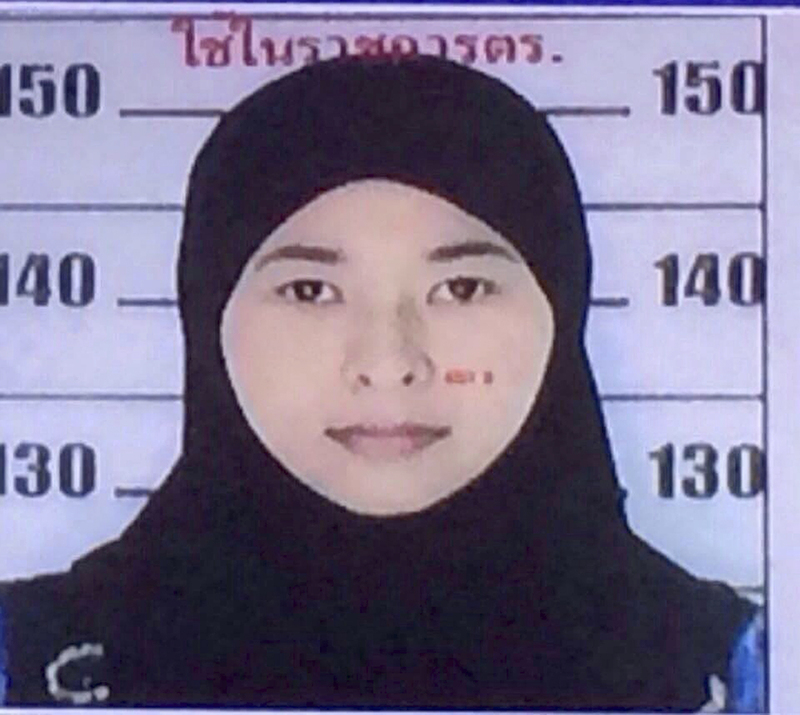 In a televised announcement on Monday, Prawuth displayed a photograph of the woman’s Thai identification card showing a young woman in a black headscarf, and a sketch of the man. He later said police were asking for additional arrest warrants. Police said Monday evening that relatives of the woman, identified as 26-year-old Wanna Suansun, said they believe she is in Turkey. The developments came after police arrested a man in an apartment in Bangkok’s outskirts on Saturday and seized bomb-making equipment that included detonators, ball bearings and a metal pipe that could serve as a bomb casing. Police, meanwhile, awarded themselves a 3 million baht, or $84,000, reward Monday offered for tips leading to the arrest of bombing suspects. National police chief Somyot Poompanmoung said he was taking the unusual step of giving the reward to the police force both to motivate his officers and to show that Thailand’s police are good at their work. “This money should be given to officials who did their job,” he said at a news conference as aides brought out stacks of 1,000-baht notes. It wasn’t immediately clear how the money would be distributed to police officers. More bomb-making materials were discovered in a second apartment during a raid Sunday in a nearby neighborhood, said Prawuth. He said that apartment, in a neighborhood known as Min Buri, was rented by Wanna Suansun, also known by the name Mai Saloh. He said the woman has a house registration in the southern Thai province of Phang Nga. Police raided the house in Phang Nga, but failed to find her. Police Maj. Gen Chalit Keawyarat said her relatives told them she had been away for more than three months, and they believed she was in Turkey because her husband is Turkish. “The relatives are trying to contact her so that she could prove her innocence to the police. The relatives believe she is not involved,” Chalit said. Turkey has previously figured in the bombing investigation. No one has claimed responsibility for the attack, sparking an array of theories about who might be behind it. Police have suggested that the suspects were part of a people-smuggling group who held a grudge against Thai authorities. Speculation has grown, however, that the suspect might be part of a group seeking to avenge Thailand’s forced repatriation of ethnic Uighurs to China in July. Uighurs are related to Turks, and Turkey is home to a large Uighur community. The Erawan Shrine is especially popular with Chinese tourists, feeding the idea that it could be a target for people who believe the Uighurs are oppressed by China’s government. Beijing says some Uighurs are Islamist terrorists, and among them is a group that has been smuggled out of China to join Islamic State fighters in Syria. The suspect arrested Saturday had a Turkish passport, though Thai authorities say it was fake. At his apartment, they seized at least 11 passports that appeared to be Turkish, among more than 200 passports in all. Much remains unknown about the man arrested Saturday, including his true name and nationality and his motive. On Sunday, Prawuth said police were working with “a number of embassies” and interpreters to try to establish the man’s nationality, adding that he did not speak Thai but spoke some English. Authorities have dodged questions about whether the suspect is believed to be Turkish, declaring that the Turkish Embassy said he isn’t. Other possibilities are that the perpetrators are Muslim separatists from southern Thailand, opponents of Thailand’s military government or feuding factions within the security services. Prawuth described what police found in the second Bangkok apartment as “important bomb-making materials such as gunpowder, urea-based fertilizer which can be used as explosive powder when mixed with other substances, a remote-controlled car with its controller which can be used as a detonator, nuts and bolts, small light bulbs and digital watches,” among other things. The arrest warrants for Wanna Suansun and the unnamed man say they are wanted on a charge of conspiracy to possess unauthorized war material, a reference to the gunpowder. The wanted man, whose face is shown in a police sketch with short brown hair and a light beard and mustache, is believed to have lived in the apartment rented by the woman, said Prawuth, adding that his nationality is not known. He told The Associated Press the man’s name is Jusuf, but did not explain how he learned that or give a precise spelling. The blast at the Erawan Shrine was unprecedented in the Thai capital, where smaller bombs have been employed in domestic political violence over the past decade, but not in an effort to cause large-scale casualties. No doubt the black hand of Islamic terror has spread to Thailand. But it's corrupt govt has little chance of catching the culprits. The $87,000 reward is peanuts.